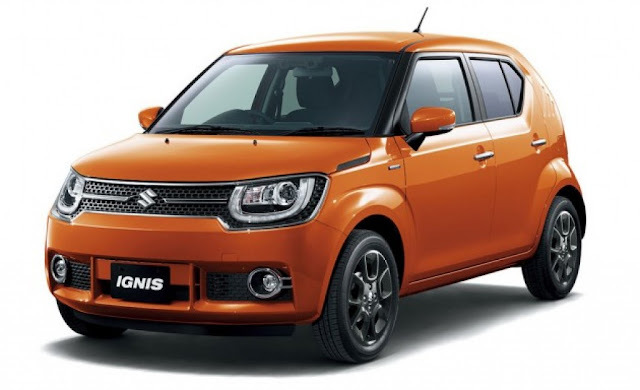 Maruti Suzuki is readying a compact crossover SUV car called Ignis and this is an important launch for the company, mainly because the car flaunts a design that is extremely creative and totally different from other Suzuki cars. It is the first under four-meter crossover car engineered by the company. The styling of the car is futuristic and is based on the revolutionary Suzuki iM 4-concept and this was showcased at the prestigious 2015 Geneva Motor Show and it was the car that amazed millions of spectators. Presently the vehicle is still in the manufacturing stage, and is undergoing extensive testing and is expected to launch sometime during the festive season. Despite the car not yet being production ready, it is still a significant launch for Maruti Suzuki and is among the most publicized new launches. What makes the Ignis a spectacular upcoming product, let us dive into some of the intriguing characteristics of the car that makes it stand out. It is the exterior architecture of Ignis that makes it highly desirable at first sight, and the innovative Suzuki iM 4-concept is clearly visible on the car. Maruti Suzuki has engineered the vehicle with an incredibly unique design theme called ‘’Shape the Inspiration’’. The Ignis is great attraction at first sight, it exhibits a youthful design and it is refreshing and different from other products in its class. The Ignis will be engineered with four-wheel drive system and high ground clearance facilitating efficient maneuvering on rugged and unruly roads. Maruti Suzuki has used a simple yet advanced design method on the exterior. The features that will attract the public to a large extent is the slender and boxy architecture and huge wheels that enhances the masculine SUV nature of the car. The other creative style cues are the chic front portion with trendy headlights and grille to create a typical sunglass clad look, the arty vents on C pillar and helmet kind of roof design also accentuates the inventive design features of the vehicle. The interior of Ignis looks funky, the black interior painted with silver accents looks fantastic also watch out for the neat orange coloring on center console. The car is going to be heavily feature loaded with a stunning SmartPlay infotainment system fitted with BlueTooth and USB connectivity, multifunction steering wheel and reverse parking sensors. Just like the exterior, the interior is going to be a new surprise package, and the styling will be completely aesthetic and different and it is expected to be more ultra-modern and different from that of even Baleno and Swift. The Ignis will be incorporated with Harman next-gen infotainment system and this is one feature that makes the car more desirable than other existing and upcoming products. The infotainment system will be connected to Apple CarPlay and it offers an advanced connectivity system and has navigation, voice-recognition function, and Apple iPhone facilities like messaging, music playback and call receiving. The Harman infotainment system also has a Human Machine Interface (HMI) that allows the driver to concentrate on road conditions while driving. The Ignis will run on a highly efficient four cylinder 1.2-liter Dualjet petrol engine engineered with the revolutionary SHVS mild hybrid technology and the benefit of this equipment is superior mileage and a choice of four-wheel drive and two-wheel drive car. There is also a 1.0-liter petrol Boosterjet turbo engine. Maruti Suzuki will incorporate a new 1.2-liter diesel engine in the car and this is the 3-cylinder variant of potent 800cc engine fitted in Celerio and the engine will release efficient 70bhp power. There will be an automatic Ignis car as well fitted with the innovative CVT gearbox and the company has indeed created wide engine choice options, and automatic cars is gaining importance in Indian market and the automatic Ignis will be easy to maneuver on roads packed with traffic. The Ignis will be sold in Maruti Suzuki’s highly established Nexa showroom, and it is nothing like any other dealership, in fact it is extraordinary. The vision behind the construction of Nexa showroom is to create a luxurious and first-rate automobile retailing experience. The Nexa showroom is designed with an incredible white and black monochromatic theme and the center is fitted with powerful air-conditioners to provide customers with top-class service and comfort. The main unique selling proposition of Maruti Suzuki with Nexa is hospitality and pampering, the employees are expected to showcase adequate warmth and etiquette to customers, and customers can feel as comfortable as possible, since they are being given separate seating areas and cubicles in order for the customer and employee to have their own privacy. The Ignis will be sold within a price range of Rs 5 to 7 lakhs. The Ignis is an exclusive compact crossover SUV launch in India, and it is known to look exceptionally modern compared to other Maruti Suzuki creations. The exterior architecture is signature and the trendiness is visible on the slender design, creatively styled body and classy looking headlights, grille, bumper, wheel arches and tail lights. Whenever we view the Ignis and it just looks amazingly fashionable and youthful. The interior is filled with new aesthetics, the dashboard, ultra-modern steering wheel, and next-gen Harman infotainment system is just spectacular beyond words. The jet black interior looks awesome and the silver accents and funky orange coloring looks wonderful. Car enthusiasts will surely be fascinated by the interiors of Ignis, only because it is so different and designed to create a new level of fantasy. Maruti Suzuki will launch Ignis with wide range of engine options, with a 1.2-liter petrol, diesel and CVT automatic engine. The forthcoming Ignis is premium and it will be sold in an exclusively posh showroom Nexa, which makes buying the car all the more exciting. The whole nation is waiting for the Ignis and the car is still in the testing stage and already there is so much of attraction engraved on it. For those who can’t wait to buy the Maruti Ignis will have to patiently wait till the festive season, and its biggest rival in the compact crossover SUV market is Mahindra KUV100. It is a car with great value for money. Previous Previous post: What Are The Benefits Of Having Video Production Company In Melbourne?